These words, written by Lexington journalist J. Soule Smith over a century ago in a euphonic ode to the marriage of bourbon and mint evoke the allure and grace of perhaps the most iconic cocktail second to the martini. Thousands of mint juleps will be mixed, served, and consumed this Derby weekend, many of them diluted, frat party versions of the ideal. 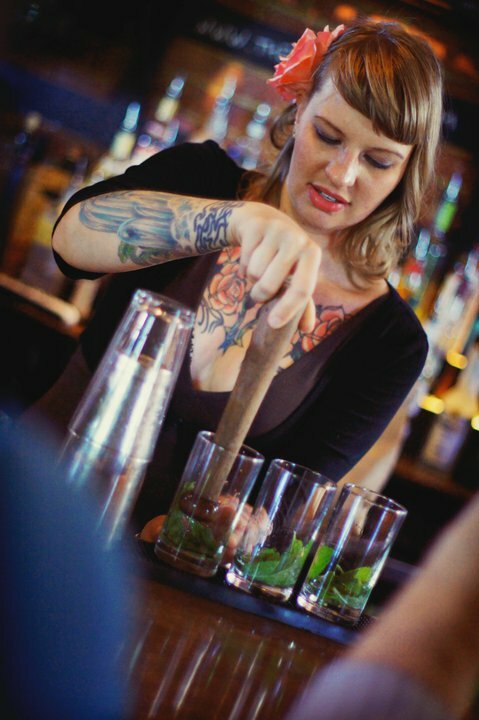 If that’s been your experience, I invite you to try the recipes below contributed by local mixologist Molly Wellmann. You don’t need a horse race to enjoy this drink, just a warm day. The word julep originates from the Arabic drink known as a “julab,” a mixture of water and rose petals. The drink eventually traveled to the Mediterranean, where mint replaced the rose petals. During 18th century colonial America, the julep–made with rye whiskey or rum–was popular as a morning pick-me-up. The Mint Julep became the official drink of the derby in 1938, where it was first made with Early Times whiskey and sold in a souvenir cup for seventy-five cents. The julep is a strong drink–sip slowly! By the time you’ve finished your last sip, the ice should just be melted. The most important element of the julep is the shaved or crushed ice. If you don’t have an ice shaver, lay out a clean cloth towel on a solid surface. Put your cubed ice in the middle and wrap the towel over and around it. Using a mallet, a meat-tenderizing tool, or even the bottom of a pan, smack the crap out of the ice until it is nicely crushed. Unwrap the towel and there you have it–crushed ice (and a little less stress!). Don’t smash the hell out of the mint; it’s delicate stuff. * Wellmann likes to finish the julep with a drizzle of dark rum on top (such as Ron Zucapa or Myer’s Dark Rum) as a throwback to the 18th century version. Place mint in the bottom of a cocktail mixing glass. Add the sugar and a splash of the bourbon (about a half ounce). Using a wooden spoon or muddler, lightly press the mint just to bruise it. Add the remaining bourbon and stir (do not shake) everything together. Strain over the crushed ice and garnish with a mint sprig. Drink slowly and enjoy! If you are not a fan of bourbon, Wellmann recommends this lighter version. A small handful of raspberries, blueberries, or other seasonal fruit. Place mint in the bottom of a cocktail mixing glass. Add the sugar and a splash of the sparkling wine (about a half ounce). Using a wooden spoon or muddler, lightly bruise the mint. Add the rest of the sparkling wine and stir (don’t shake) slowly. Strain over ice in the highball glass. Gently drizzle the brandy or cognac on top. Add the fruit and garnish with the mint sprig. Drink slowly and enjoy!